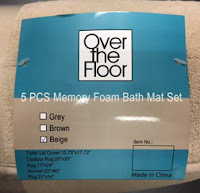 The TTABlog®: TTAB Test: Is "OVER THE FLOOR" Merely Descriptive of Rugs and Mats? TTAB Test: Is "OVER THE FLOOR" Merely Descriptive of Rugs and Mats? The USPTO refused to register the mark OVER THE FLOOR, finding it to be merely descriptive of "bath mats; personal exercise mats; meditation mats; gymnasium exercise mats; yoga mats; door mats; floor pads and non-skid floor mats in the nature of non-slip pads for use under rugs or carpet to prevent slippage; rugs; area rugs." Applicant argued that “the ‘mental link’ between the mark OVER THE FLOOR and Applicant’s goods as recited in the application is neither immediate nor instantaneous, and that its goods are placed on the floor, not over the floor. How do you think this came out? In re Mats & Rugs LLC, Serial No. 87594162 (December 4, 2018)[not precedential] (Opinion by Judge Jyll Taylor). It is clear that the wording “OVER THE FLOOR,” as a whole, immediately describes a characteristic, purpose or function of the identified mats, floor pads and rugs, namely, that they cover, or are placed over, the floor and provide comfort, protection and/or decoration. The combination of terms is not incongruous, and no additional information is needed for the merely descriptive significance thereof to be readily apparent to prospective purchasers of rugs, mats and other floor coverings. Applicant maintained that its goods do not "'cover' the floor; that is, they do not hide it." Nor are they principally used to "protect" the floor. According to applicant "the principal intent … [is to] provide an aesthetic element to the space in which it is placed, . . . [and] greater comfort for feet on a hard or cold surface." The Board was not impressed: "That Applicant’s goods are intended to be multi-functional does not detract from their protective function, or, more to the point, where they are placed in relation to flooring, even if protection is not the featured function." Applicant asserted that the phrase OVER THE FLOOR is not in common usage or needed by competitors to describe goods placed "on the floor." Again, the Board was unimpressed: "That the phrase OVER THE FLOOR is not in common parlance is not controlling. That Applicant may be the first and only user of a merely descriptive designation does not justify registration if the only significance conveyed by the term is merely descriptive." Finally, applicant urged than any doubt as to registrability should be resolved in its favor, but the Board had no doubt that the mark is merely descriptive of the goods. And so it affirmed the Section 2(e)(1) refusal. TTABlog comment: WYHA? Can a mark be refused registration on the ground of obviousness? I mean, where else would you put a rug or mat? Under the floor? Some people hang rugs on the wall for decoration. What if the mark had been "Over the wall?" Sorry, the TTAB has gone obtuse on this one. "Over The Floor" could equally refer to a quality/characteristic of a table, a bench, a counter, a sideboard, a cabinet ... how about a stove, etc., all of which sit "over the floor." 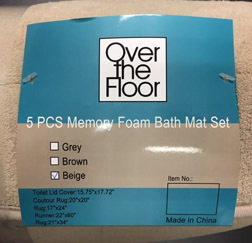 It seems so obvious that "over the floor" requires an extra step of imagination to arrange at the conclusion that it refers to rugs. That extra step is the essence of a suggestive mark, and hence an distinctive mark. Lord, save use from literal-minded bureaucrats. MAIPL: the mark must be considered in the context of the goods: rugs and mats. Robert Frank: What about bath mats? I don't know of anyone who hangs those on a wall. I've seen people use floor tiles and wooden floor boards (and so over) on a wall and then hang a rug over them, but not usually a bath mat. Aladdin's carpets sit over the floor. Some consistency would be nice. How this is not allowable but SNAP & POUR for a funnel that you snap on and then pour, is beyond me. "On the floor" might be descriptive of rugs, but even then the association might not be instantaneous. But "over the floor"? My first thought was the expression "all over the floor", which is best left alone. I doubt that "over the floor" is merely descriptive of any rugs except those famous levitating Persian carpets. Perhaps, in the context of the goods, a play on the common phrase over the moon which conveys a feeling of happiness or being pleased?